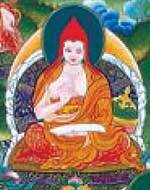 And liberates sentient beings through teaching dependent arising. I bow my head to you, the Conqueror, Sun among Teachers. Through the profound logical presentation of dependent arising. Who is the glorious crowning jewel amongst all the holders of Nagarjuna’s teachings. And who has ascended to the utmost state of accomplishment. And accepted the shared perception of valid cognitions and external objects. Through dependent arising and the merely conditional (nature of things). With the versatile means and reasons of the profound and the vast. And disseminated the teaching of the Conqueror in the Land of Snows. Flawlessly clarified the Conqueror’s doctrine in the Land of Snows. Who revealed the vast path and as prophesied, blazed the trail of the Mind Only system. The foremost scholar, renowned as a second Omniscient One. To reveal the system of Buddha’s scriptures through the power of natural logic. And who was adept in expounding the marvelous ways of the Dharma. The meaning of the Perfection of Wisdom as it came from the Asanga brothers. And who the Conqueror prophesied would expound the meaning of the Mother. Thoroughly and unmistakenly explained individual liberation. Thoroughly explained what the vast scriptures meant. The doctrines of the vast and profound that are the complete teaching of the Conqueror. May I be blessed that I may mature my mindstream and achieve liberation. And that boundless compassion that wishes to protect wandering beings. On the meaning of the commentaries of the great pioneers. The words and insights of the teachings through explanation and practice. May the ground of this great world be adorned in this way. May I work for sentient beings as long as space remains.